Young Cats Ready for Retirement ... Are Now Ready for their Forever Home! Our beautiful Cats shown below have already been selected by new Owners. Poquita Dulce is retired and lives with Sirah! See their photos on the STUDS and QUEENS pages. Santa Fe Bengal Bodacious Belle has looks that are fantastic and she has a personality to match. She has wonderful honey red coloring and beautiful green eyes. She always greets us with the distinctive "Bengal Bark." Over her breeding lifetime, she has been bred with "Studman" and produced show stopping Kittens -- the traits of both parents were passed on and then intensified. Her litters have all been amazing, but she has been given the gift of retirement. Bodacious Belle has joined her mate, Studman, and now lives in Boulder., CO with Encarnita. Thank you so much for giving one of our favorite girls such a happy House Cat life with you and her handsome mate, Studman!!! We miss her, but are very glad that she is so happy!! Bodacious Belle and Studman napping together in their new home in Colorado! Stud of Santa Fe Bengal - we call him "Studman" - has an impressive lineage and has produced Kittens with desirable large rosettes with rufousing. Studman has very intense gold eyes, superb coloring and confirmation, plus he has an engaging personality to match his good looks! He is a very sweet and loving boy, even before he was neutered - yes, this boy has been given House Cat status and he is now living in a wonderful home in Boulder, CO with his new Owner, Encarnita, and very happily with his mate, Bodacious Belle!! Click HERE to view more photos of Studman. Click HERE to view photos of Studman's parents and his pedigree. 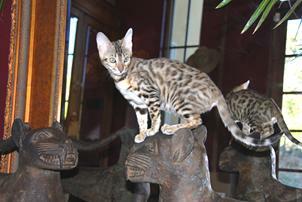 Meet Nocha of Santa Fe Bengal... she has lovely dark markings with rosettes and glitter. Our new girl is from Unique Prints Cattery and we were thrilled to add her to our Cattery's gene pool, but she is not physically meant to be a breeding Queen. Her father is Grand Champion Walkabout Envy of Unique Prints. She has very famous Millwood Grand and great Grand Parents, such as Millwood Xclaim, Millwood Epitimiss, Millwood Highbrow, Millwood Italian Filigree and Millwood Italian Lace. Nocha has gone to her forever home with Carole in Taos, NM!! Gorgeous Gaja is a very lucky girl! She went home with Mary in Arizona and both Bengal and human alike are very happy! Her name is now "GiGi". We miss our girl, but are so pleased to have placed her in the right forever home! Thanks Mary! Gaja is not longer available and is in her new home. We are sad to loose Jules to our breeding program, but after her second litter she had a life-threatening issue in her uterus and we had to had an emergency spaying done. Happily, she continued nursing her two Kittens a full eight weeks, instead of the usual 2 weeks, once a female is spayed. She has produced incredible Kittens, but it is now time for her to find her forever home and be a loving House Cat for the rest of her life. Jules still plays like she is a Kitten and likes to snuggle in bed with us. Juliet's Birthday is 11/25/07, so she is just two years old. On 12/25/09 Juliet was selected and has gone to her new home! Check out what her new Owners say about both Juliet and Portia (they went to the same forever home!) on our Testimonials page. 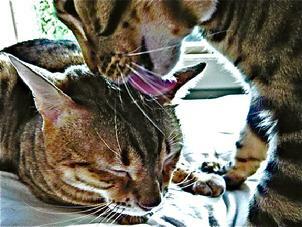 Portia is a very pretty, young Marble Bengal female. Portia has had several litters with Studman and produces attractive, well-marked kittens... in fact, we have kept two of her Kittens (Perfect Pandora and Poquita Dulce), because of their spectacular markings and we want to pass them on to the next generation... so, it is time for Portia to retire, since we now have her progeny to continue the bloodline. Her Birthday is 10/19/06, making her currently, not quite, 3 years old. She is friendly and sweet, loves to sit on laps, loves to play; she will be a perfect house cat. Contact us to meet her in person! On 12/25/09 Portia was selected and has gone to her new home! Marblette has found her forever home! She is no longer available. Great news for Marblette!! She has just been spayed and is going to her new home ... she is a very sweet Cat and we are thrilled that she will have a wonderful life with her new owners. It is a perfect match: cat and human... her new owners are just as nice as she is and will give her the attention and love that she deserves! Thank you to Cathie and Tad B. for being excellent cat owners and giving "Kenya" the perfect forever home! Marblette as a kitten, 12 weeks old - THIS TEENAGE KITTEN HAS BEEN SOLD AND HAS GONE TO HER NEW HOME!